Bears are hungry, and they will easily get into your garbage if you do not secure it correctly. EDITOR’S NOTE: Some of the rules and laws in this story are specific to Incline Village. Contact your local government agency or trash provider to learn what laws affect your community. INCLINE VILLAGE, Nev. — Living at Tahoe means we share this beautiful landscape with black bears. The lack of snow this winter means no hibernation and less natural food for the bears. They are hungry and seeking food resources in Dumpsters, trash cans, buildings and vehicles. 1. In Incline Village and Crystal Bay, garbage must be secured at all times except for placement at the curb after 5 a.m. on trash collection day. Fines for non-compliance are severe. 2. The most effective way to store household garbage is inside a metal bear box or locking metal locking dumpster. IVGID Public Works offers a $150 rebate on residential bear boxes. For information call 775-832-1284 or online at yourtahoeplace.com/public-works/waste-not/bear-wildlife-awareness. 3. Wildlife-resistant carts are a secondary option, though not as secure or durable. 4. Garages and utility sheds are the least secure storage options. 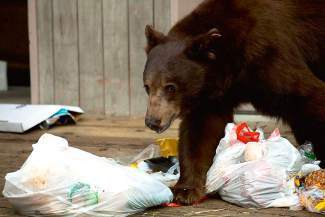 Bears will make strong effort to get into garages with garbage and damages can be costly. 5. Always lock dumpsters securely, with no gap between the body and lid. 6. If secure storage is not available, or you are leaving before your assigned trash collection day, take advantage of the free drop-off of two bags of trash at the Incline Transfer station 7 days a week. 7. Don’t leave food in your car and lock your car doors. Air fresheners, gum, mints, coffee cups and takeout containers are all attractants. 8. If you want to compost use an indoor worm-bin composting for kitchen scraps. 9. Never feed wildlife. Don’t use bird feeders. 10. Feed your pets indoors. 11. Keep the barbecue clean. 12. Cook with doors and windows closed. 13. Authorities recommend making noise to scare away a bear you find on your property. Always make sure that the bear has an obvious escape route, and never act aggressively toward a bear in a confined space. 14. Always use caution and common sense when dealing with wildlife. “IVGID Tip” is a bi-weekly feature running in the North Lake Tahoe Bonanza, in partnership with the Incline Village General Improvement District, providing locals with various tips pertaining to the recreation opportunities and services the district provides. This tip was provided by IVGID Waste Not. For information, call 775-832-1284, email wastenot@ivgid.org, or contact the 24-hour trash hotline at 775-832-1221 to report a trash problem.